This is an in-depth product review of Research Verified, Body and Breath, Natural Deodorant and Freshener. After extensive research we have found that this is one of the best, if not the best products on the market. Research Verified, Body and Breath, Natural Deodorant is specifically designed to eliminate foul odor by balancing good and bad bacteria in the body, especially in the alimentary canal. It also assists the immune system in warding off any excessive odor-inducing bacteria. Please read on to find out more about this product. Lactobacilius Acidophilus promotes intestinal health. Chlorophyillin-Copper Complex or Chlorophyllin (SCC) is an internal deodorant that eliminates intestinal odor. Green Tea ( Camellia sinensis) Extract treats body odor and halitosis. Magnolia (magnolia officinalis) Bark Extract treats digestive problems. Peppermint (minthia peperita oil) soothes the alimentary canal. Fennel (foeniculum vulgare) Seed cleanses the digestive and respiratory tract. Magnesium Stearate ensures that each pill has the correct dosage. Calcium Carbonate aids digestion and neutralizes stomach acid. This product is a dietary supplement and you may take up to 3 capsules per day. However we recommend that for continued use, you should take 1 capsule, 2 times daily; one time in the morning and one time in the afternoon before meals, with 8 oz. of water. Please do not exceed the recommended dose. If you are pregnant, nursing or under the age of 18, please consult a physician before taking this product. This product comes with discounted deals. Purchase 1 bottle (a month’s supply) at a cost $48 (a mark down from $69.95) and save 21.95 or 31%. Purchase 3 bottles (3 months supply) for $98 (a mark down from $209.85) and save 111.85 or 53%. Purchase 6 bottles (6 month’s supply) for $142 (a mark down from 419.70) and save 277.70 or 66%. This product comes with a 1 year or 365 days guarantee. If you would like a refund, please fill out the contact form that is made available on their website or call them at 800-685-3330 or send an email to [email protected] and they will make arrangements to give you a full refund (less shipping). You may send your product back (empty, used or unopened) and they will give you a refund as soon as they receive it. No Hassles. No Questions. If the merchandise was purchased through a “Buy Three, Get Three Free” or similar offer, ALL items must be returned in order to receive a full refund. If you return a partial amount of the merchandise, you will forfeit the free product and receive a refund on the discount price per item based on the total purchase. It is important to note that this product has received excellent reviews. This product is one of the most highly recommended ones on the market. It is the ideal product for oral health management and the elimination of body odor. This is also a natural supplement that is 100% pure and contains no preservatives, artificial coloring or hormones. It also comes with a 1-year warranty which is indicative of its high quality, that is supported by impressive testimonials. 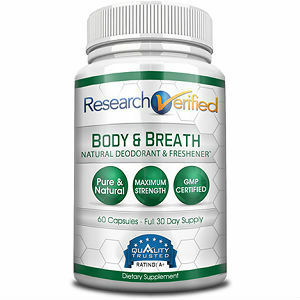 Tim McClure	reviewed Research Verified Body and Breath Natural Deodorant	on December 23rd	 and gave it a rating of 5.